Conjugating French verbs can be challenging, especially if you are new to the language or if you don't speak it every day. It's much easier to conjugate verbs using an online conjugation chart or with printable charts that you can keep on hand to use as a point of reference for your written and spoken French language communication needs. The following widget presents complete conjugation charts for the most commonly used verbs in French. Use it to look up proper conjugation for both regular and irregular verbs. Select the first letter of the verb you want to conjugate from the row of letters across the top. Click on the verb you want from the list that appears on the screen. 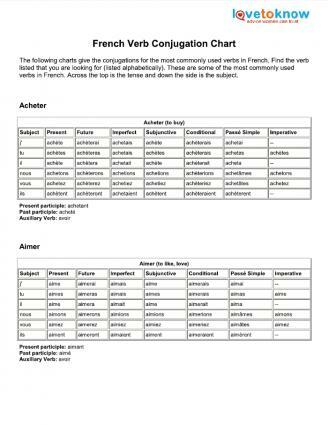 Click the image below to download a PDF document featuring charts that give conjugations for the most commonly used verbs in French. Find the verb listed that you are looking for (listed alphabetically). Across the top is the tense and down the side is the subject. 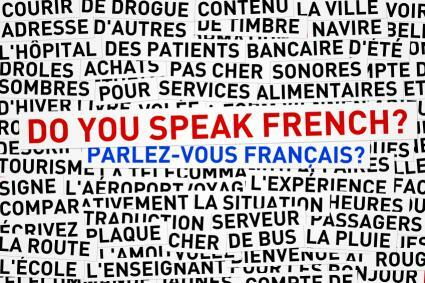 These resources for verb conjugations can go a long way toward helping you perfect your French language skills. Take advantage of every opportunity to practice what you have learned!